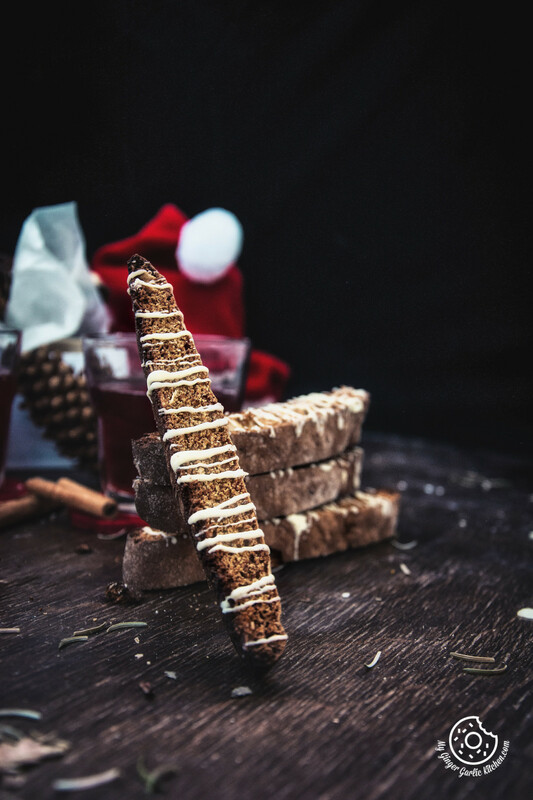 This Homemade Gingerbread Biscotti Recipe makes a crispy and spicy Winter/Christmas Holiday delight. This spiced up biscotti is the perfect crunchy cookie for enjoying with your favorite steaming cup of coffee, or herbal tea, or hot chocolate or anything else which you like. This gingerbread biscotti recipe is very easy simple to follow. 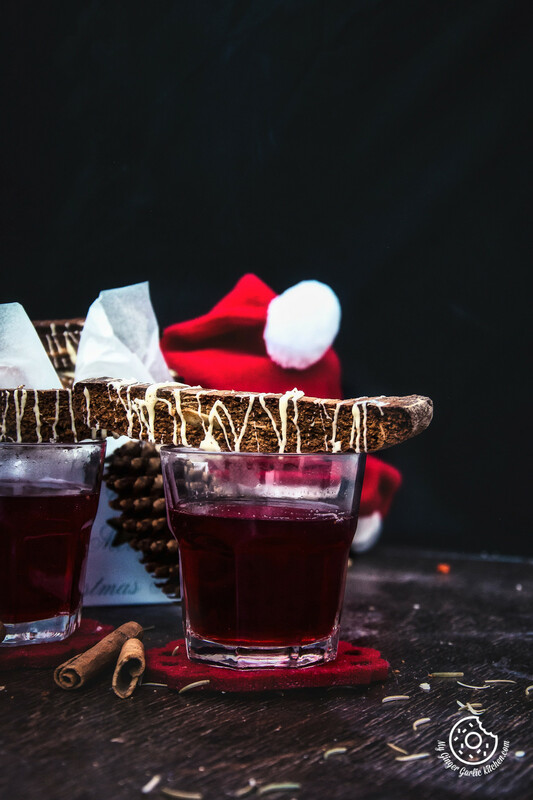 This holiday season bake this gingerbread biscotti recipe at home and these boys will definitely fill your home with the wonderful aroma of gingerbread. They make a wonderful home-baked Christmas gift! Christmas is around the corner and we are all ready to have as many gingerbread treats as possible. Ain’t we? There is no such thing as enough gingerbread. Isn’t it? This is especially true when it comes to Gingerbread Biscotti. Do you remember when I mentioned that December is all about gingerbread in my earlier post about Gingerbread Truffles? It’s where I made a promise to share more gingerbread recipes in the coming days? So here I am, with my second gingerbread recipe. This Homemade Gingerbread Biscotti Recipe makes a crispy and spicy Winter/Christmas Holiday delight. This spiced up biscotti is the perfect crunchy cookie for enjoying with your favorite steaming cup of coffee, or herbal tea, or hot chocolate or anything else which you like. They taste like a gingersnap. And that too with white chocolate? They are the most delectable and addictive treats. These biscotti are perfectly crisp, crunchy, delicious and flavorful. The spices with the sweetness of the chocolate make this an outstanding combination. So all in all these biscotti are holiday desires transformed into a bar. 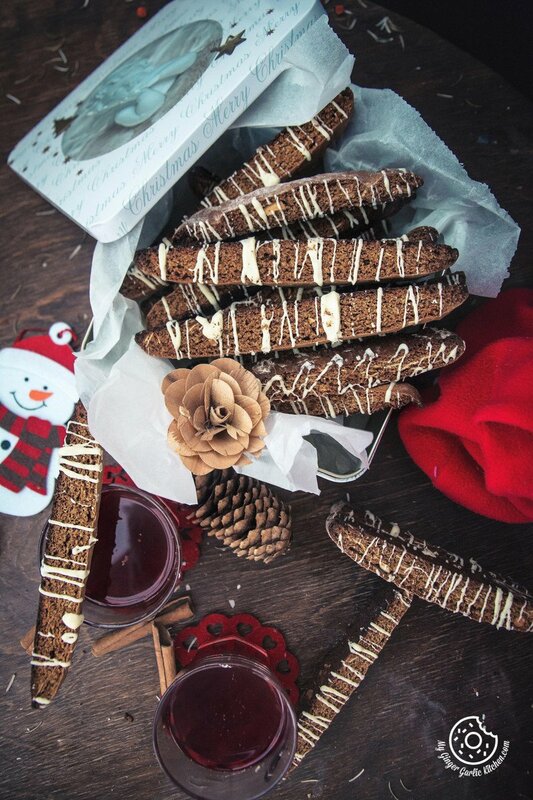 How to Make Gingerbread Biscotti? All of us are on the hunt for the perfect edible holiday gift idea. Isn’t it? Festive cookies are something which keeps all of us in the mood of the big holiday party. Wrap them up, along with some holiday tea bags or coffee. They will be amazing. 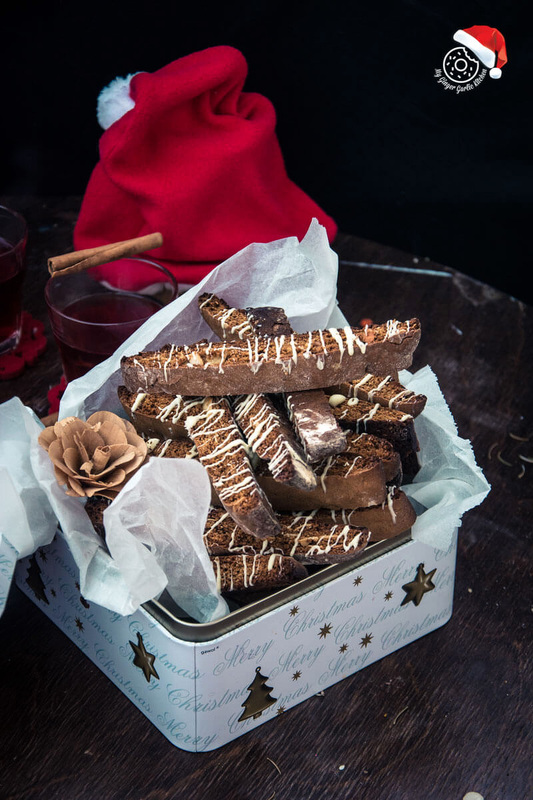 These delectable gingerbread biscotti are that wonderful of a gift for this season. 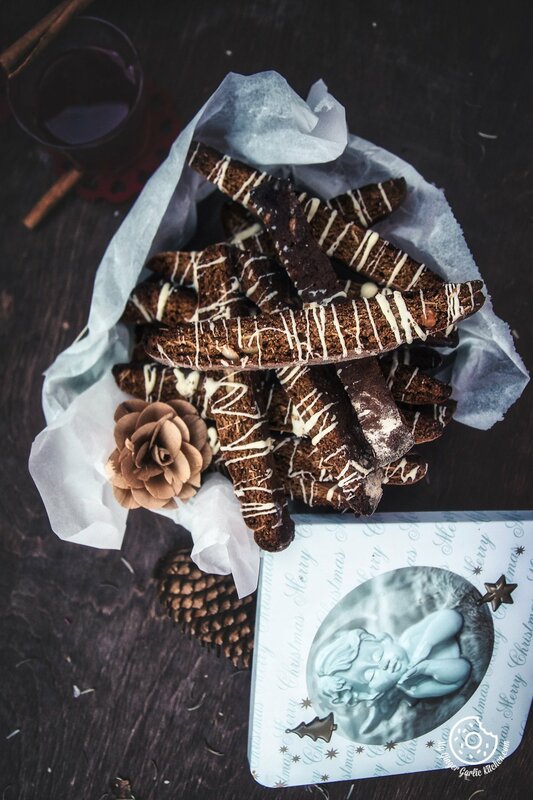 Gingerbread Biscotti = long lasting gifts. How to serve Gingerbread Biscotti? 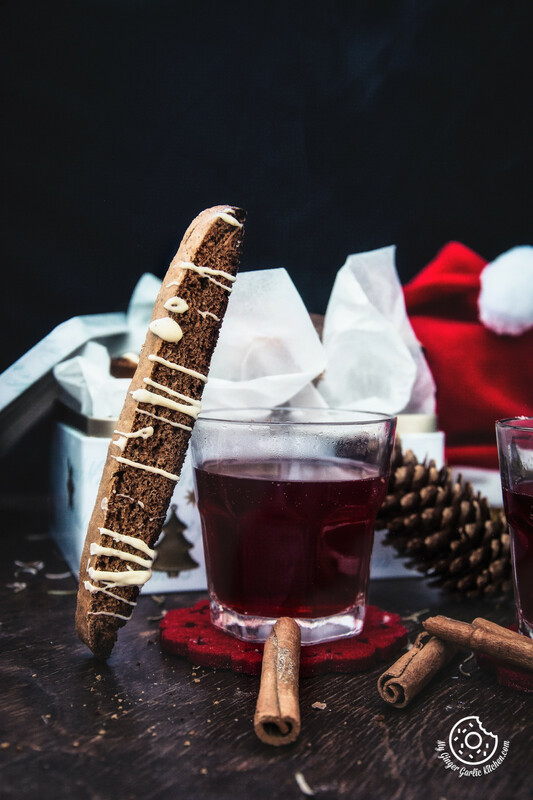 Gingerbread Biscotti taste phenomenal with hot drinks: I love one remarkable thing about biscotti that they are so crispy and crunchy and taste more awesome when dunked into a hot drink. Just dunk them into a hot cup of tea or coffee until they get nice and soft, and get ready to savor the yummy flavors of winter. This hot drink dipping enhances their taste for sure. I personally love to have them with a warm mug of mulled wine. 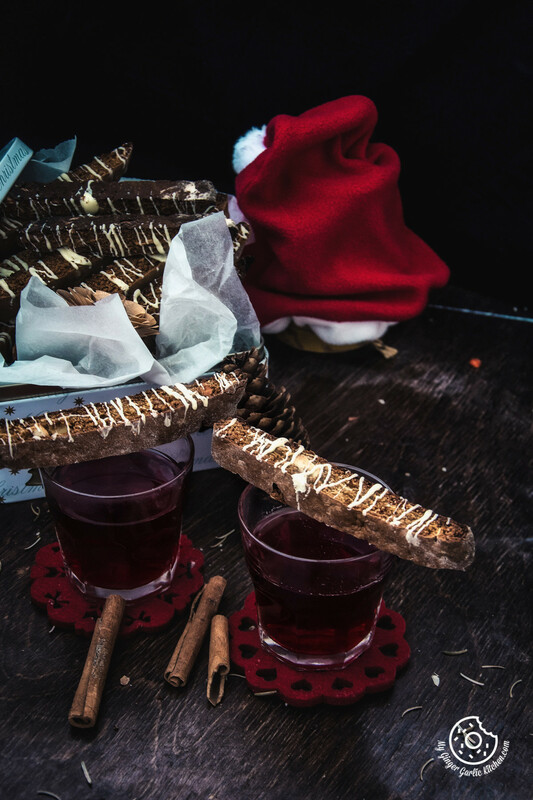 Mulled red wine + Gingerbread Biscotti = Holiday Mood Celebration. And when I don’t have mulled red wine, then I love to dunk them in hot milk coffee. So as a coffee lover I can tell that these biscotti are the wanted delights for us. They also taste wonderful when they are plain, but you can surely add some texture by adding any of your favorite nuts or chocolate to them. You can add any of your favorite nuts or chocolate to them, but I like my gingerbread biscotti plain with gingerbread cookie frosting drizzled over the top. I have added cloves to this recipe, but if you don’t have cloves, you can also substitute cloves with the same amount of allspice. This recipe only makes 24 biscotti, but you can surely double the recipe if you are planning to bake them as a holiday gift. These can be served as a midday snack, or even a light after meal dessert. 1. Heat oven to 350°F/175C. 2. Line/grease 2 baking trays and set aside. 3. In a large bowl whisk together oil, sugar, eggs, and molasses. 4. Beat at medium speed, until well mixed. 5. Add ginger, clove, cinnamon, pepper, baking powder, vanilla extract, baking soda, and flour. 6. Mix with a spatula to form a stiff dough. 7. Add almonds and mix well to combine. 8. Divide dough in half; Place halves on lined/greased trays. 9. Using lightly floured hands, shape each portion into a flat log which is 12-inch high and 8-inch wide. Thickness should be 1/2 inch. 10. Bake 22-25 minutes or until lightly browned and tops are slightly cracked. 11. Remove from oven, and set aside to cool. 12. When cool enough to touch, cut into 1/2 inch thick diagonal slices. 13. Place slices, cut sides down, on a baking sheet, and bake an additional 7 minutes on each side, or until toasted and crispy. 14. Remove from pan, and cool completely on a wire rack. 15. Drizzle with melted white chocolate. 16. Let them set at room temperature until chocolate drizzle hardens. Serve hot with hot tea/coffee. 1. Store biscotti in an airtight container. 2. Baked biscotti stay fresh in airtight containers at room temperature for a couple of weeks.